Wexford just made it over the line ahead of Tipperary in a photo finish in the senior hurling final. It was a game that had the punters going from muttering about being too one sided at half time, to talking about how it was the best game of hurling every seen by the time the final whistle sounded. The Slaneysiders won the game with literally the last ball stuck in the Boston hurling championships. Wexford looked like they would walk it after the first 30 minutes, but Tipperary pulled themselves back into it and brought the game into extra time. It was back and forth for the 20 minutes of the extra period with the lead changing hands 5 times, the final time in Wexford’s favour with a Mark Walsh point from play as there was not even time left for the puckout. In spite of losing Shane Hennessey for a period early in the first half, Wexford put their stamp on the game. By the end of the first period the Wexfordmen held a comfortable seven point lead. Mark Walsh took the free taking duties and put three over the bar. Hennessey had accounted for three points before exiting the fray. Wexford got a goal courtesy of Joe Clarke, who Peter Ryan fed and Clarke smashed the ball home. Walsh rounded off the scoring with a free before half time. Tipperary did not manage to find room to shoot. Dominc McGill was on form at center back and Wexford won most of the possession from puck outs. Frances Devanney, Thomas Waters, and Alan McCrabbe each pointed for Tipp, who trailed by seven points going into the break. Tipperary took the field for the second half with a changed lineup, and notably Owen McCormack came in as a substitute. Wexford got the first score of the second half, another Mark Walsh free, but Tipp got some hope from a goal right from the puckout. After Dominic McGill put one over for Wexford, Tipperary scored 6 points in a row to narrow the deficit to a single point. Then came another penalty. Alan McCrabbe took it and this time shot low and put Tipp a goal to the good. Wexford answered with three points on the trot to level the scores, and with the game on the line Tipp missed two great chances to take the lead, the shots drifting wide. Mark Walsh then put Wexford ahead on the stroke of 30 minutes, but Tipp answered immediately with a point from Gareth Sinnott to send the game into extra time. Tipp took the lead in extra time with a point from Owen McCormack, but lost it, won it back and then lost it again for the last time. There were wonderful catching, hard hitting, and great scores in a game that had the spectators glued to their seats. It looked like Austin Murphy’s point would win it but Frances Devanney equaled it with as good a score. With 30 minutes up Mark Walsh had the final shot of the game and made it over the bar for Wexford to win their third hurling championship in a row. It was a game worthy of a championship final, and fittingly the final game of the Boston championships. Wexford: E. Sprune, D. Brennan, D. Redmond, P. Holden, Dominic McGill (0-1), Richie Kehoe (0-2), B. Dalton, Joe Clarke (1-0), Mark Walsh (0-10), Shane Hennessey (0-5), Austin Murphy (0-2), P. Ryan, C. O’Connor. Tipp: J. Howard, R. Hennessey, J. O’Sullivan, M. Jordan, C. Dempsey, J. Coughlan, S. Power, G. Barry, Thomas Waters (0-1), Frances Devanney (0-3), Alan McCrabbe (1-5), John McGrath (0-1), Gareth Sinnott (0-2). Sub: Owen McCormack (1-3),O. Mahoney (0-1). Gareth Concar and Graham Norton vie for the advantage. McAnespies took their fourth championship in a row with a comprehensive victory over Donegal, and truth be told, the margin of victory could have higher. It seems a far cry from the Buffalo Bills days of the South Boston side when victory in the big one always escaped them. An early first half goal, followed by a second mid way through the half put the Macs in the drivers seat, while Donegal did nothing to help their cause. When enjoying a long spell of dominance in possession, and a chance to regain their footing and recover, Donegal kicked wide after wide. The usually reliable Kevin Curran and Dualtach Molloy missed some good chances, and Donegal’s hopes drifted away as the wides mounted. McAnespies got off to a dream start, and never looked in danger of giving up their title from the word go. Conor McGourty goaled in the third minute, and the score was quickly followed with points from Steven McGettigan and Colm McCrory (free). McAnespies had a couple of chances to blow the game wide open before Doengal got a score. McGettigan found McGourty with a great pass and McGourty’s shot hit the post. Donegal introduced Ciaran Bonner to the fray in an effort to turn things around, and Bonner did bring some mettle to Donegal’s efforts. Dualtach Molloy finally pointed from a free after 10 minutes, but rather than settle down the side, Donegal proceeded to kick 5 wides. With Donegal enjoying a good spell in terms of possession, McAnespies netted a second time. Danny McBride was pulled down in the box as he bore down on goal, and Christy Lynch placed his shot well into the bottom corner. The wides mounted for Donegal as neither Dualtach Molloy nor Kevin Curran could find direction. Eventually Molloy pointed from play, and David Donegan put one over for McAnespies before the half time whistle. McAnespies by seven at the half; 2-3 to 0-2. McAnespies defence gave no room to Donegal all afternoon. Things did not improve for Donegal after the restart. Within 3 minutes McAnespies had themselves another penalty and again, Lynch did not err in his shot. McAnespies now 10 points ahead. Frustation crept in for Donegal, Bonner had his name taken shortly afterwards. The futility of Donegal’s efforts were underlined by the removal of what had been the mainstays of their attack all season, Dualtach Molloy and Eamon Murphy. Ironically enough, their replacements, Michael McGinty and Ronan Diver each pointed shortly after their introduction. McAnespies regained control of affairs again, Alan Feeney, who had an outstanding game, and Christy Lynch who was on top of his man all day, each pointed from their back line. David Donegan also contributed on the scoreboard with a goal after 20 minutes and Donegal’s chances of winning evaporated completely. Plenty of satisfaction in the McAnespies camp having been beaten in each of the junior football finals, taking the big one more than makes up for it. Macs: D. Traynor, Christy Lynch (2-1), G. Norton, David Donegan (1-1), N. Kerr, A. Feeney, M. Stanbrook, D. McBride, C. Galligan, D. Lally, Colm McCrory (0-1), Conor John McGourty (1-2), Steven McGettigan (0-1). Donegal: N. O’Connell, T. Maguire, P. Witherow, O. Wade, K. Cunningham, N. Hegarty, D. McNulty, R. McNeilis, Dualtach Molloy (0-1), E. Murphy, K. Curran, G. Concar, Declan Murphy (1-1). Subs: Michael McGinty (0-1), Ronan Diver (0-2), Ciaran Bonner (0-1). Roscommon pulled the rug from under Tir na nOg at the very last minute with a late goal to steal the Ladies senior football championship. With Tir na nOg leading by two points everything changed as Roscommon scored two minutes into injury time to claim the Ladies Junior Title. Tir na nOg enjoyed a healthier dose of possession than their opponents in the first half and held a four point lead at the break. The forward line displayed some great passing and registered some fine scores. A goal from Lisa McAleer mid way though the half put Tir na nOg in the drivers seat. With Roscommon leading by three points to two, McAleer put an excellently placed shot inside the foot of the far post to put Tir na nOg ahead. Tir na nOg put the Roscommon back line under pressure and registered three more points before half time through Grainne McClean and McAleer. Karen Maloney got one back for Roscommon before the half time whistle to make it a Tir na nOg four point lead at the break. The Tir na nOg back line shone in the early going as Roscommon endeavored to turn the tables. Winning high balls, blocking kicks, and competing well, Tir na nOg frustrated Roscommon’s forwards. There were a couple of stoppages for heavy challenges that required the intervention of the physio as neither side was willing to give an inch. Colleen Barrett put the Brighton side five to the good, and Claffey cancelled her point. After 17 minutes of play in the second half the difference between the sides was still four points until Karen Maloney put a fine free kick over the bar from 45 yards for Roscommon. Maloney followed with a great point from play to reduce the deficit to two points with 10 minutes to go. It was Roscommon’s turn to show some steel at the back, Laura Burns made some timely interventions. Maloney further reduced the gap to a point with a free with just one minute to go. Right after Grainne McClean put Tir na nOg two points to the good with a free Roscommon delivered a hammer blow. Roscommon swept up the field and full forward Fiona Claffey rounded her marker to shoot into the back of the net. Tir na nOg had one final chance to equalize but Maria Keane’s long range free drifted wide of the far post. When the final whistle blew Tir na nOg could hardly believe what had transpired, while Roscommon celebrated. Tir na nOg: F. Gohery, N. Daly, C. O’Higgins, S. Bourke, D. Murtagh, D. O’Sullivan, A. Molloy, J. Moran, A. McDaid, Colleen Barrett (0-1), K. Murphy, Grainne McClean (0-4), Lisa McAleer (1-1), M. Keane, Angie Monaghan (0-1). Roscommon: N. Kavanagh, L. Burns, J. O’Connell, P. Bourke, K. McManus, J. Rogers, J. Mulligan, E. McGirr, I. McNulty, Karen Maloney (0-7), C. Benson, S. McGovern, M. Fox, Fiona Claffey (1-1), L. Harte. McAnespies' Paul Meegan Looks for help. Donegal captured the junior A football championship in a very exciting, bruising, and tense encounter with Aiden McAnespies. Donegal played some great football, and forwards Paul Boyce and Aiden O’Hagen proved huge factors in their victory. Donegal led from the start but McAnespies made it close at the end, almost pulling off a late victory as Gary Hennessey’s shot flew over rather than under in bar during injury time. Donegal got off to a great start in the first meeting of the day between the two clubs, and got into a five points to two lead after 15 minutes. McAnespies then had the better of things for the remainder of the first half, but missed several good chances to score. In contrast, Donegal’s only foray forward resulted in a Paul Boyce point that lifted the siege. McAnespies’ Shane Lynn made it six points to three at the half with the game very much open. Possession was keenly contested around the middle of the field, and each side fought hard to gain an advantage. Jonathan Byrne and Simon McDonagh for Donegal and Thomas Tuite and Shane Lynn for McAnespies contested everything as if their lives depended on it. McAnespies made inroads early in the half and reduced the deficit to a point with scores from Eugene McKenna and Tuite. However, Donegal came back with a score from a Paul Boyce free. Boyce then won a penalty that was taken by former Tyrone minor, Aiden O’Hagen. O’Hagen’s well directed shot found the back of the net and Donegal were five points to the good. McAnespies made a huge effort to cut into the lead. Barry Brogan ran from corner back to point, and Shane Lynn, McKenna and Nigel Regan each pointed to make it a two point game with less then 3 minutes left. 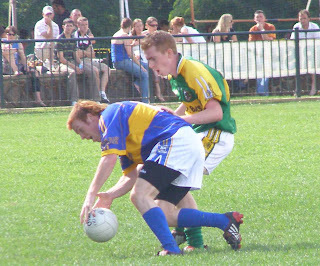 Donegal's Paul Boyce on the attack. Ricky Rush pointed to put Donegal three to the good again, but Gary Hennessey rushed through from midfield immediately from the ensuing kickout and his shot from the 21-yard line flew over the bar – a goal would have tied it. McAnespies put the pressure on Donegal in the final minutes in an effort to get the goal that would win the game, but Donegal held out and took the first of the games between the teams. Donegal: E. McLaughlin, D. Harkin, R. Grant, K. McGee, D. McNulty, F. Granaghan, S. McDonagh, J. Byrne, Paul Friel (0-1), Adrian O’Hagen (1-3), Paul Boyce (0-4), M. Corr, S. Kelly. Ricky Rushe (0-1). Macs: B. Arkinson, Barry Brogan (0-2), B. McMenamin, N. Clancy, C. Dempsey, Thomas Tuite (0-1), Shane Lynn (0-2), G. Hennessey, Nigel Regan (0-2), M. Doherty, E. Daly, P. Nugent, Eugene McKenna (0-4). Johnny Moroney and Brian Mullin contest a high ball. Kerry looked like they had this game in the bag after the first 20 minutes. The Kingdom led by eight points to one, and Galway looked like they were just not interested. Whatever happened in Galway minds, or Kerry minds for that matter, the game was turned on it’s head for the final 40 minutes. Galway outscored Kerry by 12 points to 2 over that period. Perhaps Kerry thought the game was won and rested on their laurels, perhaps Galway realized there was a championship to win, and started playing some football. Richard O’Sullivan, Bernard O’Connor, and Mark O’Sullivan were lording it and having their way with their opposite numbers in the early going and it looked like there was only one team interested in winning the game. Johnny Moroney stole forward from center back to point, and O’Sullivan, Ger Molloy and O’Connor each scored for Kerry in the early going. As the points accumulated in the Kerry column, Galway supporters were beginning to wonder if their team were interested. The tribesmen answered that question and pulled themselves back into it. Graeme Molloy led the charge with three points, one from a turnover that highlighted the change in momentum from Kerry to Galway. After Galway had made it three points to eight, Ger Molloy was coming out of defence for Kerry in what looked like another move that would end in a Kerry score, only to cough up the ball to his namesake, who soloed up the field and made it a four point deficit instead of Kerry extending their lead to six. Galway added points from Joe Clarke, Molloy, and Tom Walsh before half time and Kerry’s lead was down to one point, and the momentum lay with Galway. Galway took over in the second half, and really should have put the game away in the first 20 minutes. Molloy, Brian Mullin, Peter Nolan and Tom Walsh played a big part in Galway’s dominance during this period, but there were at least four if not five shots at goal that on any other day would have gone over, but Galway missed them all. Galway did take the lead on a point from Peter Nolan, but by that stage should have been four or five ahead. Kerry were badly struggling and seldom attacked the Galway goal. It began to look as if Galway regret all those misses. Brian Mullin extended the lead to two, before Martin Sweeney pulled a point back for Kerry with five minutes to go. Kerry must have been wondering how they were still in the game and had a chance to win it. Mark O’Sullivan found himself through with room to shoot, and his shot came back off the crossbar to Ger Molloy whose shot went wide. Galway rallied to put two more over the bar through substitute Richie Kehoe, and extended the lead to three points. The tribesman could have buried the game when Kehoe found Matt McKenna with a lovely pass and McKenna blazed wide when a sure goal was there. Less than a minute later Kerry had the chance to equalize, but Sweeney’s shot trundled inches wide. Kerry laid siege for the last minute to try and find the equalizing goal, but Galway held out. Peter Ryan got under a couple of balls to clear, and there were what looked like 22 players inside the Galway 21 yard line. Galway held out and in doing so won a second intermediate championship in three years. Kerry: D.Diggins, D. Forde, S. Moriarty, M. Godley, Johnny Moroney (0-1), G. Barry, Richard O’Sullivan (0-2), David Waters (0-2), Ger Molloy (0-1), Bernard O’Connor (0-2), P. Devane, Mark O’Sullivan (0-1), Martin Sweeney (0-1). Galway: P. Ryan, S. Melia, M. Rafter, JJ O’Neill, Joe Clarke (0-1), S. Gallagher, B. Mullin (0-1), Graeme Molloy (0-3), Matt McKenna (0-1), Tom Walsh (0-2), Peter Nolan (0-1), D. Redmond, Eoghan McCormack (0-2). Sub: Richie Kehoe (0-2). Tipperary put on a great team display and showed great sense of purpose to win the junior hurling title on Saturday, and in doing so took their second Boston junior title in a row. After 15 minutes Tipp’s focus along with their desire showed through as they worked themselves into an unassailable lead. Brendan McLaughlin was on form and the Carrickmore man scored two goals at key junctures of the game to help put the game beyond Wexford. Wexford held a slight edge after the opening quarter, but then Tipperary gradually took control of the game and scored a goal and five points without reply. McLauglin feasted on an abundance of possession as plenty of ball found its way into his corner, and scored a fine goal with 20 minutes played. His partner in the full forward line, Paul Ryan, had goaled earlier in the game, and Tipperary will have been happy with first half return in that department. At the opposite end of the field, dual corner back, Christy Lynch executed his duties well as Wexford found the going tough in the final third of the field. At one point Mark Daly made a fine save from Graeme Molloy, but soon afterwards, Shane Kehoe scored Wexford’s goal. It was a fortunate one that looked to be heading over the bar from long range, but dropped short and with the sun in the keepers eyes, into the back of the net. Wexford’s points came from Stephen Delaney, while McLaughlin, Daithi Waters, and Fergal McDonnell pointed for Tipp. At the half Tipp led by a goal and four points. Christy Lynch carries the ball out of defence for Tipp as Graeme Molloy shadows him. Tipp drove home their advantage in the second half. Scoring a goal and five points to two points for Wexford, Tipperary wrapped up the game. After extended their lead with points from Kevin McGreavey and Paul Ryan, McLauglin showed his predatory instincts and Tyrone man fired home a rebound, which more or less sealed Wexford’s fate. With 10 minutes to go Wexford generated some goal chances, but Mark Daly saved well on a number of occasions. Wexford battled on and managed a goal from Tom Drennan and Graeme Molloy points, but Tipp were too far ahead for the Wexfordmen to have a serious chance of catching them. A deserved win for Tipp, who go on to the North American Finals as Boston champions. Paul Bannon Breaks Through the McAnespies Defence. It has been a long time coming, but for the New England Celtics the wait was worth it. After eight years and 4 finals, the Celtics won their first Boston Championship. Youth was a factor as the Celtics ability to keep up the tempo over 60 minutes proves crucial to the outcome. The Celtics extended their lead to double digits early in the second half,and threatened to run away with it. With 10 minutes to go McAnespies caused the local born players some anxious moments as they put a goal and three points up to a solitary point for the Celtics, but the Celtics hung on until the final whistle and received their just reward after a long wait. The first half featured 5 goals, 2 for McAnespies and three for the Celtics. Both sides had periods where they played good football. When it seemed that the Celtics were about to pull away, McAnespies reined them back in. With the sides sitting on a point each, the Celtics goaled first with a Liam Fleming penalty. Will Fleming was fouled in the area and first cousin Liam converted the kick. Niall Duffy pulled a goal back for McAnespies but the Celtics goaled again through Paul Bannon. Bannon picked up a breaking ball and fired home with only the keeper to beat. The Celtics were looking good and though it was early in the game, seemed to have control of affairs. McAnepies, however, answered with another goal. Paddy Stones shot from close range and now it was McAnespies leading by a point. The Celtics came back with a goal, their third, and two points to finish the half. Two Liam Fleming dead ball kicks from long range sailed over the bar, and then Will Fleming goaled on the stroke of half time to give the Celtics a four point advantage at the break. The Celtics got the all important scored after the restart with two Fleming frees and after 10 minutes a Pearse Lombard goal put the all American side nine points ahead. The Celtics won possession from almost all kickouts. Danny Kenneally Liam Fleming, and Jerry Kenneally led the Celtics charge, while Brendan Kelly and Pearse Lombard were instrumental in the forward line. The Celtics then kicked several wides, which almost came back to bite them as McAnespies made a late run. Trailing by 10 points McAnespies narrowed the deficit to 5 with five minutes still to go, and one began to wonder whether the Celtics had it to hang on. Paul Meegan goaled and points came from Owen McCusker, Paddy Stones and Declan Slevin. Slevin’s shot was for goal and shaved the crossbar on the way over; th e Celtics were living dangerously. Unfortunately for McAnespies time was the enemy, and the Celtics managed to settle down and see out the clock. There were few who would begrudge the Celtics their first win, least of all McAnespies with whom there have been some hard fought battles over the years. Pearse Lombard Tries to Find a Way Through. Macs: C. Taite, P. McKenna, C. Trayner, S. McGlinchy, A. Comerford, F. McDonald,T. Tuite, J. Taylor, D. Gormley, Paul Meegan (1-1), M. Casey, Paddy Stones (1-2), Niall Duffy (1-1). Subs: Owen McCusker (0-1), Declan Slevin (0-1). Celtics: R. Graber, M. Fleming, P. Kerrigan, J. Kenneally, K. Fleming, C. Walsh, D. Kenneally, Liam Fleming (1-5), Brendan Kelly (0-1), Paul Bannon (1-0), Pearse Lombard (1-2), M. O’Connor, Will Fleming (1-0). Inter Football: Galway 0-13 Kerry 0-10. Tir na nOg have looked like contenders for the championship all year. The Brighton side suffered only one defeat during the season to the Boston Shamrocks. Tir na nOg are a strong side and have some excellent forwards. Maria Keane would be the first name that comes to mind when mentioning the Tir na nOg forwards, but there are others that can make hay for Tir na nOg. Angela Monaghan at full forward, Colleen Barrett on the wing, and Katie Murphy at center forward. 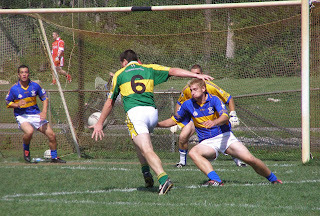 Roscommon won their first game of the season last week, and have reached the final by virtue of a fine overall performance against the Boston Shamrocks. Roscommon have some powerful weapons in their arsenal in Fiona Claffey, Karen Maloney and Caroline Benson, not to mention a solid keeper in Niamh Kavanagh - which can keep them in it even if the team is not playing well. Given Roscommon's record up to last weekend, the Shamrocks may have taken them a little lightly and fell into a big hole, however, when the Shamrocks dug in Roscommon found it difficult to keep up their momentum and escaped with a one-point win. The pressure will be on Tir na nOg since they carry the weight of expectation on their shoulders, not to mention that this would be the first senior championship for the club - the first one is the hardest to win. If the Brighton side start off in top gear Roscommon could find it tough going. I'd have to favour Tir na nOg to win their first senior football championship. Wexford are going for three-in-a-row for Boston championships on Sunday afternoon. The Slaneysiders have been a mixed bag this year, starting off well, going off the boil for a couple of games, and then putting in a great performance against Brighton rivals, Galway. Wexford have some players to turn a game. Shane Hennessy in the forward line, Austin Murphy in the middle, and Joe Clarke in the half back line will be key. One name that featured prominently early on was Richie Kehoe, the Wexford county hurler who decided to spend a year in Boston, started off the season well, and even last week his performance seemed to be lacking some spark. Tipp have grown into the season and made the final with their last game of year. Some may argue that Tipp should start games a man down since twice this year they have lifted their performance following a sending off of one of their own. Tipp have some solid players in Richie Hennessy, John Coughlin, and Cronan Dempsey. Then there is the Dublin county hurler who decided to came to Boston this year, Alan McCrabbe. Like the team as a whole McCrabbe has looked more comfortable as the season has progressed and a good performance from him will be vital to Tipp's cause. With last weekend off, Tipp could get off to a slow start, and falling behind in the early going could prove fatal. Wexford would seem to have the horses to claim their third Boston championship in a row, and I'd have to say I'd expect to see the Slaneysiders ahead when the final whistle blows. A contrast in styles. McAnespies have been the pace-setters this year, and at times have looked far ahead of any of their nearest rivals. In their last couple of games McAnespies have looked mortal. The return to Ireland of players of the caliber of Mark Goettsche, David Conway, and Johnny Laverty has brought the side down a peg or two, while Donegal have seen Dualtach Molloy return after a hand injury. McAnespies are the more physical of the two sides, their back line played the Shannon Blues tough and did a good job keeping the Blues forwards in check. Colm McCrory seems to have found himself in the forward line again, and last week Benny McGettigan probably had his best outing in at least 2 years. Of course there are also Declan Lally and Conor McGourty. The St. Bridgets, Dublin, clubman who is spending the summer in Boston has been an important cog in the McAnespies machine, while McGourty is a forward of the highest class. Keeping the Dublin and Antrim county players in check will be important for Donegal's chances. Donegal are a finesse team and are capable of playing some lovely football. The northerners have a good midfield pairing in Donal McNulty and Ronan McNeilis. The side's fortunes have revolved around these two and they will need to be on form for Donegal to have a chance. The question is whether Donegal's forwards will be able to cope with the McAnespies backs. Molloy, Gareth Concar, and Eamonn Murphy have been to the fore in that area of the field but may be at a physical disadvantage. The Donegal backs will also have to cope with the likes of Lally, McCrory and McGourty - a tough assignment. Donegal will need to control posession from kickouts and make McAnespies chase them in order to win. McAnespies are the safe bet if the game becomes a grind it our affair, and I'd have to go with them to make it four in a row. From Route 128 North or South, take Exit 2A for 138 South (Stoughton). Follow for 3.6 miles, (shortly after the third set of lights) turn right on New Boston Drive and the ICC is straight ahead. Gary Gaughan tries to put some distance between himself and Graham Norton. McAnespies won a place in the senior football final where they will face Donegal after a hard fought win over the Shannon Blues. Twice McAnespies goaled, blows that would have knocked the stuffing out of most teams, but the Blues fought back and came within a goal of knocking off the team that finished top of the table. The game was physical and tough, and McAnespies played it tight in the back line and found the room at the right times to put themselves in a winning position. McAnespies held the edge at the end of the first half. A Declan Lally goal after 20 minutes put some daylight between the sides. With McAnespies leading by a point, Lally made a burst through the Blues defence and slid the ball under the advancing Declan Hawes. Up to that point it was fairly even, with McAnespies perhaps holding a slight edge in terms of the balance of play. Phillip Lydon had put three frees over the bar for the Blues and Thomas Cryan one. For McAnespies the scoring was spread out a little more; CJ McGourty, Lally, Colm McCrory, and Christy Lynch (all the way from corner back), each pointed. The Blues tried to get the ball to Gary Gaughan at every opportunity, and when receiving the ball on the run, Gaughan looked dangerous, but the McAnespies back line swallowed up the Sligoman on several occasions. McAnespies finished the half the stronger side. Conor Galligan and McCrory pointed, while Lydon converted a free that was conceded by McAnespies by virtue of a badly taken free in their own defence. At the half McAnespies led by five. CJ McGourty rises to meet an incoming pass with the sun in his eyes. The Blues began the second half well and made a run at McAnespies. After McCrory pointed for McAnespies, the Blues put three unanswered points over the bar to bring it to within a score, but McAnespies struck with a second goal. McGourty fed the inrushing Lally who sidefooted into the empty net. This followed a Lally point, and the lead was seven. The Blues had something left in the tank to mount a late comeback. Philip Lydon pointed from a free and as the Blues carried the game to McAnespies they won a penalty. Ken Kileen, was introduced to the fray and the experienced Sligoman was bundled over in the penalty area. Lydon kept his cool and made no mistake with the shot. Another point was added by Neil Ewing with less than a minute left, but the Blues could not make it all the way back as McAnespies held out in the waning seconds to see themselves through to yet another Boston final. Blues: D. Hawes, K. Cryan, S. Kelly, S. Ruane, D. Kelly, Neil Ewing (0-1), S. Henry, R. Hennessy, Gary Gaughan (0-1), Philip Lydon (1-6), G. Henry, D. Wallace, Thomas Cryan (0-1). Sub: Ken Kileen (0-1). Macs: D. Traynor, Christy Lynch (0-1), G. Norton, D. Donegan, N. Kerr, A. Feeney, D. McBride, M. Stanbrook, Colm McCrory (0-3), Declan Lally (2-2), Conor Galligan (0-1), CJ. McGourty (0-2), S. McGettigan. Keith Cunningham comes out with the ball for Donegal as Marty Farrell challenges. Donegal advanced to the senior football final in impressive fashion with a resounding win over the Wolfe Tones. Donegal totally outclassed their opponents, who this scribe favoured, and in the end ran out easy winners. Donegal saw the return of Dualtach Molloy from injury, and Ciaran Bonner made a short reappearance, but had to leave the field due to a recurrence of his injury. From the middle of the first half Donegal took control of the game and the Tones could not find their way back into it and surely will be thinking that they could have left more on the field by the time it was all over. Donegal played the ball nicely when in possession and were in front at the back when the Tones tried to engineer any kind of attack. Donegal efficiently worked themselves into an eight point lead over the first 30 minutes. The northerners were first to the ball in the back line and the forwards were one step ahead of their markers. Donegal played the ball well into the forward line and enjoyed plenty of possession from the midfield exchanges. The Wolfe Tones showed well in the first quarter of the game, Jamie Murphy and Sean McVeigh pointed, each a fine score – but that was as good as it would get for the Tones. Donegal proceeded to take over for the remainder of the half. The Tir Chonaill men scored nine points to a single point for the Tones in final 20 minutes of the period. Dualtach Molloy was a sure thing with free kicks and put four in a row over the bar. The Tones could not find room when in possession and when Donegal had the ball, the South Boston side were searching for answers on how to stop their opponents. Donegal spread the wealth around; Eamon Murphy, Gareth Concar, and Ronan McNeilis also found the mark for Donegal before the half time whistle. Joey Farrell tries to find an opening for the Tones as their attack sputtered in the first half. The second half was a replay of the first, only worse from a Wolfe Tones perspective. Mick Sammon, who entered the fray as a sub, saw red as his challenge on Ciaran Bonner, who also came in for Donegal, was deemed worthy of a sending off. Dara Joyce put two early points over for the Tones, each a rousing score, but any encouragement that they may have generated were lost on the Tones. Donegal continued to pick off the points, and a goal with about 15 left from Concar well and truly killed the game. Donegal advance to final with an impressive performance and a margin of victory that nobody could have expected. Tones: W. O’Dowd, N. McKenna, D. Scullane, E. Hickson, T. Meagan, K. Gorham, J. Farrell, Sean McVeigh (0-1), Jamie Murphy (0-1), Dara Joyce (0-3), C. Farrell, Marty Farrell (0-1), S. Kelly. Donegal: N. O’Connell, P. Witherow, T. Maguire, N. Hegarty, K. Cunningham, E. Wade, Ronan McNeilis (0-2), D. McNulty, Dualtach Molloy (0-5), Eamon Murphy (0-2), Kevin Curran (0-1), Gareth Concar (1-1), D. Murphy. Sub: Ciaran Bonner (0-1). Galway and Wexford played a tremendously exciting hurling semi-final. Galway would have been slight favourites going on recent form, but it was Wexford who produced the better hurling and few would argue that they did not deserve to advance to the final. Wexford looked to have the game in the bag coming to the end of normal time, only for Galway to strike at the death with a goal and a point to force extra time. Wexford did not let it slip during extra time. The Slaneysiders kept to the formula that had put them in a winning position during the game and re-established a lead, and this time held on to it until the final whistle. Mark Walsh looks to shoot for Wexford. The first half was evenly contested for the most part, each side enjoyed good periods of hurling. Towards the end Wexford began to pull away only to be hauled back in by a Galway goal late in the half. Galway could have gone in at half time ahead. Galway won a penalty after James Kinsella was fouled in the box, but taking a position on the goal line, Dominic McGill saved the shot just before the half time whistle blew. Fintan O’Leary had opened the scoring for Galway with a point, and Shane Hennessey equalized for Wexford. O’Leary again put Galway one to the good, and Mark Walsh answered twice for Wexford. Wexford looked to be gaining an upper hand when Galway struck with a goal from Paul Barron following a good move. Wexford put four points over to one for Galway to finish the half on top, and led by eight points to a goal and four. Shane Hennessy put in a fine performance for Wexford as they overcame Galway in Sunday's hurling semi-final. Galway quickly turned it around with three points on the trot, but in the process were guilty of several bad wides which proved to be costly when all was said and done. Wexford, however, started playing the way they finished the first half. The half back line of Joe Clarke, Paddy Breen, and Dominic McGill put their stamp on the game, and Austin Murphy in the middle of the field helped Wexford impose themselves on the game. Wexford put six points over the bar without reply as Galway struggled to keep pace. Shane Hennessy, Austin Murphy, and Christy O’Connor led the rally and Galway’s goose looked to be well and truly cooked. Galway made one last gasp effort and having won a 21-yard - free, reduced the deficit to a point with a goal. Fintan O’Leary put a point over the bar to level the scores and force extra time. A reprieve for Galway to be sure. Galway could have got off to a great start to the extra period having won a second penalty. Wexford goalkeeper, Edmund Sprune, was the penalty killer this time, pulling off a great save from Eoin Foley’s shot – the Galway number four will surely like to have had one of those penalties back. Galway took first blood in extra time with a Fintan O’Leary point, but Wexford hit back with four; two Shane Hennessy frees and one each from play from Austin Murphy and Peter Ryan to lead by three at the turnaround. Wexford added a score from Hennessy and the game began to slip away from Galway. James Kinsella was sent off for a second infraction, and the ensuing Hennessy free put Wexford five points to the good. Galway went in search for a goal again, but this time it did not materialize as Wexford ensured there would not be a repeat finish in extra time. Wexford now go on to meet Tipp in the final in search of three Boston championships in a row. Galway: D. Starr, R. Goode, D. Brennan, Eoin Foley (1-0), K. Murphy, Liam Kinsella (0-1), James Kinsella (0-1), P. Carey, S. Dineen, J. Byrne, D Fitzgerald, Fintan O’Leary (0-7), Paul Barron (1-0). Wexford: E. Sprune, D. Brennan, P. Holden, D. Redmond, D. McGill, J. Clarke, R. Kehoe, Austin Murphy (0-4), Mark Walsh (0-3), Peter Ryan (0-1), Shane Hennessy (0-9), Nick Quinlan (0-1), Christy O’Connor (0-3). Roscommon barely made it in the end, and have their goalkeeper, Niamh Kavanagh, to thank for a superb penalty save in the dying seconds to deny the Shamrocks what would have been another famous comeback to add to their list of comebacks down the years. For most of the game it looked like Roscommon would win comfortably, but the Shamrocks staged a second half comeback with two goals in as many minutes and five points in a row to push Roscommon to the very end. The comeback fell one point short of forcing extra time and Roscommon, who won their first game of the season, make it to the final against Tir na nOg. Roscommon clear as the Shamrocks stage a late rally. Roscommon got off to a great start to the game. Two goals in the first quarter put Roscommon in the drivers seat. While the Shamrocks were trying to find their footing Roscommon put on a fine display of football. Fiona Claffey and Caroline Benson each goaled in the opening period, while Maggie Fox and Karen Maloney pointed. Chances for the Shamrocks were few and far between. Aisling Jennings’ free taking got the Shamrocks on the scoreboard. By half time Roscommon led by 10 points, 2-8 to 0-4 and raised some eyebrows with their performance. Roscommon opened the second half in full flow, and played some excellent football. Some great passing moves resulted in fine scores, a point from Karen Maloney was followed by a superb goal. Maloney fired the ball into the roof of the net after she was found running through. The result seemed inevitable. The Shamrocks began fighting back with about 20 minutes left in the game. The back line lifted their game and fought with determination for every ball; some great championship football. A goal came from Sinead Walsh, who netted following a great double save from Roscommon keeper, Niamh Kavanagh. Almost immediately afterwards Jennings added a second goal and Roscommon’s led was cut to six points. The Shamrocks now had belief, and began sending ball after ball in the direction of Roscommon’s goal. Leah Purcell pointed and four frees in a row from Jennings cut Roscommon’s lead to a point with five minutes left. Sharon McGovern tried to rally her side to hold off the Shamrocks and won some great ball in the Roscommon forward line. Roscommon had a chance to extend their lead back to four points with the clock winding down after Erin McGirr was tripped in the box. McGirr’s shot hit the post and the rebound was sent wide. The excitement was building as the game reached it’s climax. Maloney added a point to Roscommon’s tally, the lead was now two points and in the last second the Shamrocks won a penalty, and a chance to win the game. Kavanagh made a fantastic save, diving to her left to put a well placed shot by Tara Kealy out for a ’45. Sinead Walsh got the Shamrocks back within a point, but her score proved to be the last kick of the game. The Shamrocks almost made it back, but not quite. As in many times past the ladies provided a great game of football, and it is Roscommon who will face Brighton’s Tir na nOg in the final next Sunday. Roscommon: N. Kavanagh, L. Burns, J. O’Connell, P. Bourke, K. McManus, J. Rogers, J. Mulligan, E. McGirr, I. McNulty, Karen Maloney (1-5), Caroline Benson (1-1), S. McGovern (0-1), Maggie Fox (0-2), Fiona Claffey (1-2), L. Harte. Shamrocks: M. Harrisson, S. Killeen, J. Rock, S. Boylan, M. Cullen, S. McHugh, J. Branighan, M. Moolick, C. McEleaney, A. Doherty, Leah Purcell (0-1), J. Donnelly, T. Kealey, Aisling Jennings (1-11), Sinead Walsh (1-1). The Prize for Armagh-Notre Dame would be a date with Brighton rivals Galway in an all Brighton intermediate final. For much of the game it looked as if it might come to pass, but with the sides level going into the final quarter of the game Kerry got the crucial score to break the deadlock, a David Waters goal with 10 minutes to go proved to be the difference between the teams in the end. Armagh-Notre Dame got off to a great start. The Brighton side had two goals in the back of the net within the first 10 minutes. Brian Downes scored the first, rounding his man and finishing into the virtually empty net. The second was a excellently well placed shot from Frank Meehan with the outside of his right boot into the far corner. With the second goal Armagh-ND were five points ahead. Bernard O’Connor and Mark O’Sullivan each pointed for Kerry, while Brendan Quinn scored a minor for the northerners. At that early stage Kerry looked like they were in danger of suffering a heavy loss, but the Kingdom got their act together to pull within a point by half time. It was back lines on top for much of the half as neither forward line managed to finish off attacking moves, whether it was coughing up the ball or shooting wide, the scoreboard did not change for a long period. Kerry, however, finished the half with four points on the trot, Martin Sweeney put two nice points over the bar from wing forward, while Bernard O’Connor and Richard O’Sullivan also pointed for Kerry. O’Sullivan directed affairs from the middle of the field for Kerry, and was probably the best player on display for the first 30. At the half it was 2-1 to 0-6 in favour of the northern side. The second half was even stevens until Kerry goaled with 10 minutes to go. The sides traded points for the first 20 minutes. O’Connor, Mark O’Sullivan, and Mark Evans pointed for Kerry, while McStravog, Paudie Mulpeters, and Brendan Quinn did the same for the Brighton side. Kerry then put some daylight between the teams with a David Waters goal, Waters had been relatively quiet up to that point, but came up trumps when Kerry needed it most. Kerry added another point through Danny Fox to extend the lead to three, but McStravog and Dominic McGill got Armagh-Notre Dame back within two points and extra time looked on the cards, but not as far as Kerry were concerned. Danny Fox put Kerry two to the good, finishing off a great move, and Mike Godley made it three between the sides with the last kick of the game. It will be a Galway Kerry final next weekend. James Carlin was kept on a short leash all day. The weather co-operated and Saturday afternoon was ideal for football with a light breeze and warm temperatures. The field was a little greasy following the mid-week rains, and on occasion the players lost their footing. After a fairly evenly contested first half, Galway came to grips with the game and put in a great second half performance, playing some good team football, to leave the Gaels looking for answers. The Gaels got off to the better start and led by four points at one stage, but Galway came to grips towards the end of the half, and went on to score the last six points of the game to underline their superiority on the day. The first half was a scrappy enough affair. The Gaels enjoyed some good spells of football, but having won frees in very good positions, missed at least four great chances, two early in the half and two late in the half. In between the Gaels back line worked very hard to deny the Galway forwards the room to score. Pat McNicholas in particular stood out, and Brendan McLaughlin and Coleman Conroy also did well. At one point the Gaels led by five points to one. James Carlin put two over the bar from play and two from frees, while Frank Niblock added another. Carlin and his marker, Shane Melia, were enjoying a good tussle, and it seemed that Carlin held a slight advantage in battles won. Galway got into the game mid-way though the half, but missed several chances before finding their shooting boots. Three points on the trot before half time reduced the deficit to a single point. Graham Molloy, Tom Walsh, and Matthew McKenna each pointed to reduce the Gaels advantage to a solitary point by half time. Frank Niblock tries a shot while Joe Clarke moves in to block. The second half was a turn around for Galway. The tribesmen lifted their game while the Gaels forward line sputtered. Galway outscored the Gaels by six points to two in the first 20 minutes of the half. Galway worked hard throughout the field to get ahead and stay there. The Gaels introduced a couple of subs into the forward line, but Galway’s back line still kept one step ahead of their opponents. The Gaels over relied on Carlin and Niblick and there seemed to be a sense of urgency lacking, while the Galway worked the ball well right through the field with several players touching it before the final shot. Eoghan McCormack put four over the bar for Galway, while Graham Molloy, Peter Nolan, and Donal Redmond also got in on the act. The Gaels could have kept the game closer, but trailing by three with 10 minutes to go felt the need to shoot for goal when points might have been the better option to rein in their opponents. Galway continued to motor, and made the last stages of the game a formality. Galway deservedly advance to the intermediate final where they will meet a strong Kerry side. Gaels: J. Flaherty, B. McLaughlin, P. McNicholas, C. Conroy, M. Geoghan, D. Burns, R. Hughes, G. O’Malley, K. Cox, V. O’Malley, Frank Niblock (0-2) , T. McDonagh, James Carlin (0-4). Sub Joey Geoghan (0-1). Galway: P. Ryan, M. Rafter, S. Melia, JJ O’Neill, J. Clarke, S. Gallagher, B. Mullen, Graham Molloy (0-3), Peter Nolan (0-2), Tommy Walsh (0-1), Matthew McKenna (0-1), Donal Redmond (0-2), Eoghan McCormack (0-4). Sub: Richie Kehoe (0-1). With the win over Galway last Sunday, the Shannon Blues have earned the right to play McAnespies in the semi-final of the senior football championship next Sunday at 5:30. Donegal and the Wolfe Tones will meet earlier in the day at 2:30. Earlier in the season McAnespies were the hot favourites and looked unbeatable, however, a couple of losses in personnel for the Macs has opened the door for the other teams. The Wolfe Tones have a well rested squad of players and look like a solid outfit, while the Blues have been playing well at the right time of the year. Like McAnespies, Donegal have also suffered a loss in personnel, but Donegal have a good midfield and several nifty forwards that can cause headaches for any back line. While McAnespies are undefeated and going for their fourth Boston championship in a row, it is still not a done deal. No clear favourites this Sunday, but all year it has been looking like the Macs and Tones in an all Southie (Both teams are based in South Boston) final and I'd say both games Sunday will be theirs to lose. In many ways Tipp are a surprise package to be at the top of the table, in particular since it seemed that it would be Galway or Wexford earlier in the year. Wexford go into the playoffs looking to defend a championship, but have not been playing well of late and will meet a very good Galway team. It would seem that unless Wexford can raise their game that it will be Galway and Tipp in the final Sunday week. Wexford and Galway will meet next Sunday at 4:00. Tir na nOg make the final by virtue of some very good football, the ladies from Brighton have looked strong all year. Next Sunday the Shamrocks and Roscommon will meet in the semi final at 1:00. Roscommon have not looked sharp in recent outings. Sunday's semi-final should be interesting, the Shamrocks will be favoured to win but in recent years Roscommon have been known to turn it on at crunch time. Changed from earlier in the week to mixed sun and showers Saturday, with the possibility of scattered thunderstorms - so bring an umbrella. (Press box passes available for a nominal fee on a first come first served basis). Sunday is for sunny all day - so bring the kids. Brendan Quinn and Joey Farrell vie for posession. With their fate in the senior football championship decided, all that was in it for the Wolfe Tones was to fulfill a fixture. Win or lose the Tones would be facing Donegal in next weekend’s semi-final, while the Shannon Blues had ended Galway’s hopes, and those of Armagh-Notre Dame, of having any chance of making the senior championship playoffs by finishing on 10 points with their win earlier in the day. The Tones started without a few of their first choice players, Sean McVeigh, Collie Farrell, and Willy Milner did not feature in the starting 13. John Nolan began the game in midfield for the Tones, but the St. Annes (Dublin) man was clearly less than 100% and looked to be carrying a leg. After Marty Farrell put the Tones 2 points to the good, Armagh-Notre Dame enjoyed a slew of possession, but unfortunately for them were their own worst enemies as they failed to make the most of the period in ascendancy. There were several missed opportunities to score, and they were not half chances either. Maurice Mulpeters opened Armagh-ND’s account with a goal, and Martin McStravog added a point. The four points was all the northerners had to show for a sustained period of pressure lasting a good 10 to 15 minutes. Having soaked up the pressure, the Tones took over from there on in. After Sean Kelly and Brian Downes swapped points, Marty Farrell got the goal back for the Tones, and the South Boston side finished the half with three points on the trot from Billy O’Loughlin, Farrell, and Gary Collins. Quinn tries to find a way through for Armagh-Notre Dame. Armagh-ND opened the second half brightly with two McStravog frees to reduce the deficit to two points and began to take the game to the Tones, but the big guns entered the fray for the Blue and Navy and the Tones put the game beyond their opponents, scoring 1-10 as opposed to two points. The Tones played the ball nicely and with half-backs Jamie Murphy and Eamon Hickson bringing the game forward, the Brighton side caved to the pressure. Murphy added a goal and three points to the Tones tally, Sean Kelly three points, and Marty Farrell two as the Tones ran amok. Brendan Quinn pulled a goal back in the dying minutes of the game to salvage some respect for the northerners. Armagh-ND: C. Brady, L. Morrow, M. Digney, J. Taggart, A. Downes, F. Meehan, B. Molloy, Pauric McPeters (1-0), S. O’Donnell, Brian Downes (0-2), Martin McStravog (0-4), Brendan Quinn (1-0), Dominic McGill (0-1). Wolfe Tones: W. O’Dowd, N. McKenna, D. Scullane, E. Hickson, T. Meagan, Jamie Murphy (1-3), J. Farrell, J. Nolan, Gary Collins (0-1), Dara Joyce (0-2), Billy O’Loughlin (0-1), Marty Farrell (1-5), Sean Kelly (0-4). Sub: Willy Milner (0-1). Last weekend saw the playoff situation fall into place. The Shannon Blues defeated Galway by five points in the football, and in doing so claimed the fourth place in the senior football championship playoffs. The Blues will play McAnespies in the semis next Sunday, and Donegal and the Wolfe Tones will meet in the second semi-final. Saturday saw the senior hurlers of Tipp beat Wexford by seven points in spite of losing John Coughlin to a sending off early in the second half with the scores level at eight points each. Tipp went on the outscore their opponents by 1-6 to 0-2 and bypass the semi-final stage. Galway and Wexford will meet in the semi final and the winners will play Tipp in the final Sunday week. By the way, I'm not a golfing fan in the least but it was truly a great sporting moment for the Irish when Padraig Harrington sunk the putt on the 18th hole Sunday evening. Not bad for a Dub (even if the roots are from Cork)! Tir na nOg made the Ladies Senior Football final with a one point victory over the Boston Shamrocks and a toss of a coin. The win put the Brighton based side level on points with the Shamrocks at the top of the table. The coin toss decided which side would advance to the final, and Tir na nOg dealt a double loss to the Shamrocks on the day - the coin landed in favour of the game winners. The Shamrocks will meet Roscommon in the semi-final in two weeks time, with Tir na nOg awaiting the winners on the final the following weekend. I was involved in a junior game with the Connemara Gaels myself which was played at the same time, and unfortunately did not witness what sounded like a very exciting game between the ladies teams. Also, the Senior Hurling match between Tipperary and Wexford was postponed until Saturday next at 2:30 since early in the first half, a severe thunderstorm hit and there was no way the game could continue. 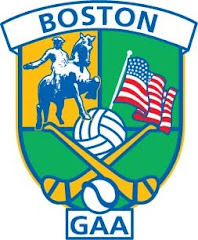 Incidentally, some of the things going on with the Gaels bode well for the future of the club and in a wider sense for the GAA in the Boston area. More about that later once the season is done after the first weekend in September, when the North American Finals are held in Canton. The Connemara Gaels could not overcome Donegal to keep them in with a chance of the senior playoffs, so it will be the Intermediate playoffs for the westerners. Donegal were that bit stronger in the middle of the field, quicker to the ball, and passed the ball well. By half time the chances of the Gaels pulling off a win were slim. Donegal had a nine-point lead and the Gaels had to work very hard for the three scores that were converted, though truth be told there could have, and some may argue should have, been two in the goal column for the Gaels. Donegal’s quickness and speed had the Gaels under pressure for most of the first 30 minutes. Kevin Curran opened the scoring with a free and Eamonn Murphy followed with another. Kieran Cox snatched a goal chance in the opening exchanges and sent the ball narrowly wide from close range, however, Donegal made the most of their own goal chance shortly afterwards when Declan Murphy sold a dummy to Pat McNicholas and buried the ball with just the keeper to beat. Donegal five points to the good with the Gaels yet to score. James Carlin got the Gaels off the mark with a free, but the Gaels struggled to add to their tally for much of the period. Declan Murphy tries to elude the attention of Michael Geoghan. After Kevin Curran put another over for Donegal, Donal McNulty finished a fine move with a point. Eamonn Murphy added another and with Donegal holding a seven point lead , the Gaels enjoyed a brief period of pressure the yielded points from Tom McDonagh and Coleman Conroy. The Gaels could have had a goal, Niall O’Connell pulled off a brave save from McDonagh as the Leitir Mor man was bearing down on goal, and Carlin rocketed the ball off the crossbar in a sequence of play shortly afterwards. Donegal, however, finished the half well having weathered the storm. Curran and Murphy pointed, and Gareth Concar scored a second goal just before half time to put Donegal in the drivers seat for the next period. The scores were few and far between in the second half and the game slowed considerably. The first 20 minutes saw McNulty put another fine point over the bar for Donegal and Carlin point from a free for the Gaels. The Gaels battled on and tried to whittle down the deficit, but the Donegal defence proved tough to break down. Carlin put another free over the bar, and Frank Niblock goaled from a 21-yard free to pull the Gaels within five points with five minutes to go. It was too little, too late however, as the Gaels could not complete the late rally, and Donegal march on to the senior championship playoffs. Gaels: J. Flaherty, B. McLoughlin, P. McNicholas, Coleman Conroy (0-1), M. Geoghan, D. Burns, R. Hughes, G. O’Malley, K. Cox, Frank Niblock (1-0), V. O’Malley, Tommy McDonagh (0-1), James Carlin (0-3). Donegal: N. O’Connell, T. Maguire, S. Lee, N. Hegarty, K. Cunningham, P. Witherow, R. McNeilis, Donal McNulty (0-2), E. Wade, Eamonn Murphy (0-3), Kevin Curran (0-3), Gareth Concar (1-0), Declan Murphy (1-0). The Shannon Blues proved to be stronger than Kerry, who, unlike the Kerrymen at home, could not bring their game to the next level. The Blues raised the tempo a notch or two in the second half and ran away with it in the end. With one game left against Galway, the Blues have it in their control to make it to the semi-finals. Just two points separated the sides at the break, and Kerry had every chance, but the Blues limited the Kingdom to a single point in the second half, and put up a goal and seven points themselves. Johnny Moroney shoots for Goal as Kerry try to get back into the game. Kerry got off to great start. Colin McDonnell was first to score for Kerry, the Naomh Barrog (Dublin – Coolock to be precise) man pointed and followed up shortly afterwards with a goal. The Blues had pointed twice through Philip Lydon at corner forward. The Blues gradually took over the game and went on to register six points, while Kerry managed just two in the same time period. Shannon Blues stalwart, Gary Henry, pointed twice and Lydon twice to pull the Blues in front. Gary Gaughan proved to be a handful for the Kerry men, the Sligo county player was full of running on the wing and created numerous scoring opportunities for the Blues. Darren Wallace pointed for the Blues and Mark Evans for Kerry before the half to make it Kerry 1-3 and the Shannon Blues 0-8. Gary Gaughan goes down on the ball, the Sligo man was in top form for the Blues. The game was gone from Kerry by the time they registered a second half score. The Blues had established a ten- point lead, and were very much in control of proceedings. Kerry missed an easy free early in the half, which did not help their cause, and did have a couple of missed chances at goal, converting one of those would certainly have helped their cause. The Blues defence gave no room to the Kerry forwards and it proved to be a frustrating half hour for the Kingdom. Stephen Henry, Sean Ruane, and Philip Lydon each pointed before Gaughan goaled with 10 minutes to go, a just reward for the hard working wing forward. After Neil Ewing pointed for the Blues, Kerry registered their first point of the second half with less than 10 minutes to go. Dave Cunningham and Lydon finished it off for the Blues to complete what surely was a satisfying win and gives them all to play for when they meet Galway next week. Blues: D. Hawes, K. Cryan, S. Kelly, S. Ruane, C. O’Grady, Neil Ewing (0-1), Stephen Henry (0-1), R. Hennessy, Gary Henry (0-2), Thomas Cryan (0-1), Gary Gaughan (1-1), Philip Lydon (0-6), Darren Wallace (0-2). Sub: Dave Cunningham (0-1). Kerry: D. Diggins, D. Forde, G. Barry, M. Godley, J. Moroney, S. Moriarty, R. O’Sullivan, D. Waters, P. Devane, Colin McDonnell (1-1), C. Hurley, Mark Evans (0-1), Mark O’Sullivan (0-1). Sub (0-1).